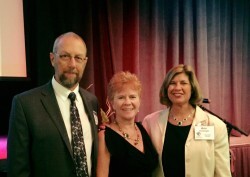 Dan and Connie as keynote speakers with Ann Hunsinger, ED at Women’s Resource Center of the Rockies. Connie and Dan have a presentation designed to drive community awareness and the effects of abortion, ultrasound imaging, and the life-affirming message of the Pregnancy Medical Clinic. Their genuine, heart-felt, and knowledgeable message will be delivered to your audience, relating the importance of the transition of the pregnancy resource center to a pregnancy medical clinic.